Our deck construction designs and practices are greatly influenced by our experience in restoration and maintenance. We have seen what works and what doesn't over the long term and apply that knowledge to layout, materials, size, orientation and other factors when designing. View our blog to read about current projects. Feel free to contact us for a free, friendly consultation. Railing design and materials can make or break the success of a deck. A great railing is low or no maintenance, designed to let the proper amount of light through, sturdy, and great value with custom features. Re-staining a wooden railing is probably the most inefficient deck practices. We have to charge a relatively high price to be able to properly stain a a railing, and since most railings contain horizontal surfaces, they often need to be re-stained more than every 4 years. That being said we do offer rail staining or painting, and use the best materials and practices available. Most cost efficient solution on most existing railings. Older railings can be prepared, scraped, washed and re-stained using a solid "opaque" stain which makes many wooden railings look new and fresh. Our deck surface restoration procedure provides our customers with the most bang for their buck per square foot compared to any other treatment. For a fraction of the cost of replacement we can sand and restore most wood decks to their original condition, and the provide easy and cheap maintenance to keep your deck looking great year after year. We always deal with every screw or nail in the deck to make sure we are not sanding over screw heads or otherwise impeding the sanding and quality of the work. 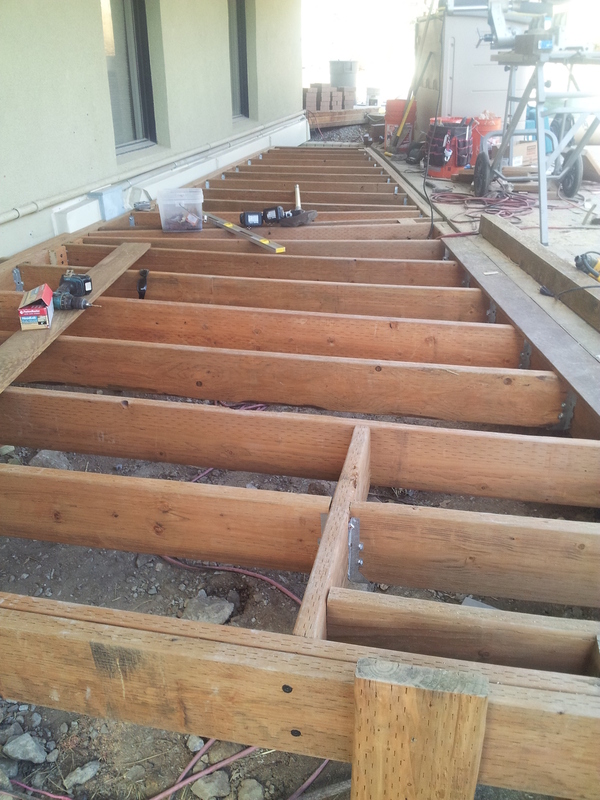 We tighten boards on all jobs maintenance and restoration. This is a key step in a quality restoration. Our sanding is hardwood floor quality, including stage rotary sanding and buff. We also acid wash and pressure wash the deck and surrounding area after sanding so everything is crystal clean prior to staining. Our finishes add the most beauty to your wood and give it the greatest protection while also providing the easiest maintenance of any other system. We have developed techniques for the trickiest projects including partical top sheet replacement, substructural work, levelling, painted decks, additions, and other common issues. There is little that we haven't seen. Our maintenance is designed to acheive maximum performance for the greatest amount of time. We focus on duration between sanding (8-10 years), which means not over applying or applying stain when the deck doesn't really need it. We offer reminders and inspections to make the process as painless as possible. The process includes a gentle pressure wash, scrub with oxalic acid, refinish. We do not remove any finish during this process, since doing so will create an uneven surface with which to re-stain. we have found that a one year maintenance after sanding is best, followed by 18-24 month staining. After each maintenance you can expect your wood to be a bit darker and slightly less transparent. We have found that most decks can go about 8-10 years between fully sanding the deck. All of our efforts are geared toward extending the time period between sanding you can get the most out of your restoration. This is where are experience puts us above other companies. We recommend maintenance in Salt Lake and Park City every 18-24 months for deck surfaces, and every 3-4 years for vertical surfaces. Our maintenance procedure will leave your deck just as protected as a restoration and costs up to 75% less. The best way to save money on maintenance is to sand the deck fully the first time in order to remove all of the existing product and then start on our program.